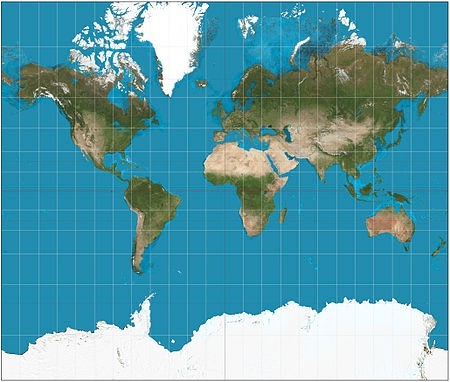 the projection used in Google Maps, Bing Maps, OpenStreetMap is a derivation of the Mercator Projection. Since it’s cylindrical, north and south are always straight up and down, west and east always goes from left to right. It’s conformal, which means it preserves the angles locally, so relatively small objects still preserve their shapes (buildings for example). The vertical lines in the image above are the longitude lines, while the horizontal lines are the latitude lines, so to change your longitude you move west or east, to change your latitude you move north or south, remember this ;). As you can see in the image, near the poles the distance between a latitude line and the next one increases, in other words the latitude lines aren’t linearly distributed, that will cause us some headaches later :(. The longitude ranges from -180 (West) to +180 (East) degrees, while latitude ranges from +90 (North) to -90 (South) degrees, Maps are are usually clipped near the poles , in Bing Maps the latitude ranges from -85.05112878 to 85.05112878 this makes the map square and prevents singularity at the poles (Sorry penguins, no maps for you :(). Tile System : okay, we have our giant square map, how do you manipulate different zoom levels? well, usually the map isn’t stored as a single image file (we’re using pre-renderd maps here), it’s actually stored as tiles, at the zoom level zero, the whole world is a single square image (usually 256*256), if we zoom to level 1 we get four equal tiles, and so on for each tile in each zoom level, it’s more like a quad tree where each node (tile) has four children (4 tiles). So at zoom level 10, the world is made up of 4^10 tiles, that’s 1,048,576 tiles :O, 17,179,869,184 tiles at zoom level 17, so if you where thinking like “I’m gonna download the whole world map”… think again ;). Anyway, usually all tiles have the same dimensions. Different indexing approaches exist, one of them is to give each tile x,y and z values, where the most top left tile of each zoom level has an index of x=0, y=0. Z (obviously) means the zoom level this tile belongs to, we’ll get to these details later. The next part of the tutorial will be short I guess, just a class diagram with some explanation. If you have any questions about this tutorial or you have something to add please use comments :). Bing maps tile system (also contains C# code for different calculations).